Matty Demaret (Barry Pepper), son of notorious mob under-boss Benny Chains (Dennis Hopper), has his friend Johnny Marbles (Seth Green), who has been trying to get into the business, run a pickup for his father. Of course, Johnny messes up royally and loses the bag while refueling at a rural airport in Montana. Now, Matty and his other friends Chris (Andy Davoli) and Taylor (Vin Diesel) must head to Montana to get the bag back. "Knockaround Guys" is the directorial debut of Brian Koppelman and David Levien, who also wrote the film. The two were known more as writers, having previously written the film "Rounders." It stars Barry Pepper as Matty Demaret, the son of mob under-boss Benny Chains, played by Dennis Hopper. Matty has been trying to find legitimate work for quite some time, but because of his father's reputation, has been unable to garner any employment. His only choice seems to be to join the family business. Matty gets an audition for himself and his friend Johnny Marbles, played by Seth Green, who has been begging for a shot to be part of the family. All Johnny has to do is fly to Washington, pick up a bag, and fly it back to New York. Being the screw up he is, Johnny loses the bag in Montana, and now Matty must head there with Johnny's cousin Chris, played by Andy Davoli, and their buddy Taylor, played Vin Diesel, who is the muscle of the group. Also in the film are John Malkovich, Tom Noonan, and Shawn Doyle. BigJ had seen this movie the year it came out, and never thought about it again. Since we are doing a Vin Diesel list on our website, we had to watch this and figured it would be a good place to start since it is one of Diesel's older films. It is kind of a low-rent mob movie starring a group of actors who, at the time, were believed to be the next big stars. They were right about one of them at least, and it ain't poor Barry Pepper. Each of the actors here, including John Malkovich, deliver their lines with ridiculously over-the-top Brooklyn accents with the exception of Vin Diesel, who simply always sounds like Vin Diesel, kind of like how Liam Neeson always sounds like Liam Neeson. The plot is pretty stupid considering the son of a mob boss sends a former coke head by himself to pick up half a million dollars and fly it across the country during which he breaks his 10-month sobriety because he just can't stay awake and happens to have some cocaine with him. You might consider sending a little insurance with him in the form of oh, we don't know, one other person since his job and life could be on the line. Of course, the laughable plot points don't end there. Upon arriving in Montana, Matty and his crew's plan to find the money is to beat up some random local tough guy who will, in turn, find the money for them. It really is a flawless plan, right?! You know, every small town is obviously run by the local bar room brawler. Just like "South Park" said! There is no real organic narrative as things only happen to push the plot along from one contrived instance to the next until it ends, leaving the audience to sit in their seats over-analyzing just how bad this movie truly is. There are a few fun elements, mostly thanks to Vin Diesel, who gets to bust a few heads and deliver a speech about being in 500+ street fights. 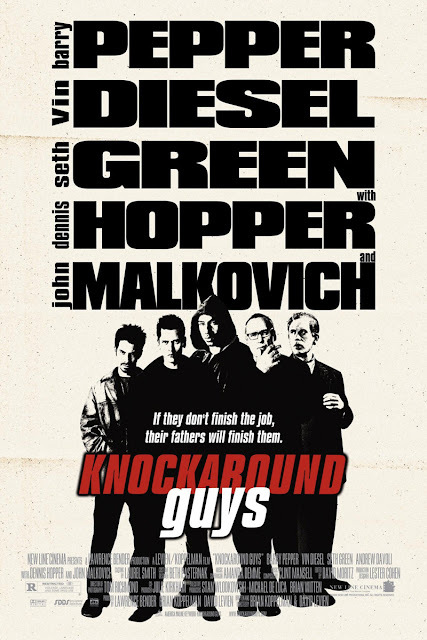 Pretty much everything else about "Knockaround Guys" is a competently predictable, by the numbers crime flick. Despite all of this, the characters are some what likable and the film is at least mildly entertaining, even if its source is from a lot of unintentional comedy.